All-natural single grain baby cereal made from pure, certified organic rice. Not only is it a nutritious meal for the baby, but the presence of a high percentage of natural starch also helps to firm the baby’s stool naturally and gently. Its unique powder texture is easy to mix with breast milk or infant formula in the baby’s bottle or as a pap. Premium Swiss quality. For baby bottles mixed with breastmilk, baby milk powder or cow's milk. For paps mixed with breastmilk, baby milk powder or cow's milk. For pap mixed with home-made, fresh ingredients. Speciallly recommended for babies with too loose stool and large appetite. 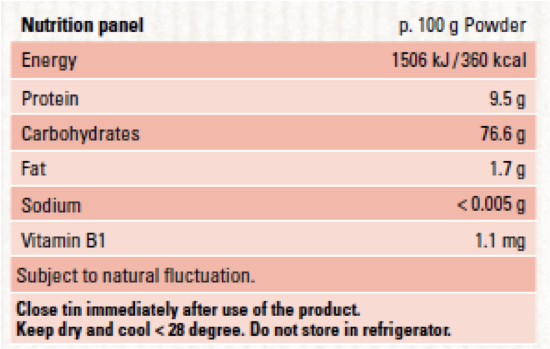 Pap with infant formula: Bring water to boiling point. Mix 4–6 tablespoons of Bimbosan Organic Rice Flour and 4–6 measuring spoons of milk powder with water cooled down to 45°C. Add water as preferred. If your baby's stool is too loose, add Bimbosan organic rice or grated apples, bananas, carrots and potatoes to the baby meal. Meals with fruits and vegetables are even tastier and more nourishing when you add Bimbosan organic rice. Add Bimbosan organic rice to the ready-to-eat meal. If your baby needs a supplement earlier, ask a specialist. Bimbosan organic rice is also ideal for gluten-free diets (for adults too). Organic rice flour* from strictly controlled organic cultivation, antioxidants (rich in tocopherol extracts), vitamin B1. *This organic raw material corresponds to the strict Swiss organic «Bud» rules. Bio-Certification: CH-BIO-006: Organic raw materials from selected Swiss organic farmers. In compliance with the strict organic standards in Switzerland. All-natural single grain baby cereal, made from pure, certified organic millet. Not only does it provide excellent nutrition, but the high percentage of natural, unsaturated fat in millet also helps to loosen the baby’s stool and to ease constipation naturally and gently. Its unique powder texture is easy to mix with breast milk or infant formula in the baby’s bottle or as a pap. Premium Swiss organic quality. For baby bottles mixed with breastmilk, baby milk powder or cow's milk> For paps mixed with breastmilk, baby milk powder or cow's milk. For pap mixed with home-made, fresh ingredients. Highly recommended for babies with too firm stool and large appetite. Pap with infant formula: Bring water to boiling point. Mix 4–6 tablespoons of Bimbosan Organic Millet Flour and 4–6 measuring spoons of milk powder with water cooled down to 45 °C. Add water as preferred. Pap with cow’s milk (not before 12 months of age): Mix 4–6 tablespoons of Bimbosan Organic Millet Flour with 120 ml cow’s milk and 60–100 ml water. Homemade pap: 1–2 tablespoons of Bimbosan Organic Millet Flour can be added to any homemade pap. Add water as preferred. Additional advice: Fruit and vegetable meals become more nutritious and nourishing by adding Bimbosan Organic Millet Flour. 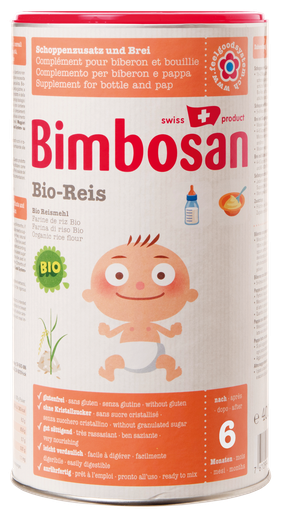 If your baby is constipated, add Bimbosan organic millet to the baby meal and avoid infant formula with starch as well as grated apples, bananas, carrots and potatoes. Meals with fruits and vegetables are even tastier and more nourishing when you add Bimbosan organic millet. Add Bimbosan organic millet to the ready-to-eat meal. Bimbosan organic millet is also ideal for gluten-free diets (for adults too). All-natural multi-grain baby cereal made from pure, certified organic maize, millet and rice. It helps babies with a sensitive stomach and large appetite day and night. It has a well-balanced grain formulation and is in harmony with the baby’s digestive system. Its unique powder texture is easy to mix with breast milk or infant formula in the baby’s bottle or as a pap. Premium Swiss quality. For baby bottles mixed with breastmilk, baby milk powder or cow's milk> For paps mixed with breastmilk, baby milk powder or cow's milk. For pap mixed with home-made, fresh ingredients. Highly recommended for babies with sensitive stomach and large appetite. Baby bottle with breast milk or infant formula: Put 2–3 measuring spoons Bimbosan Hosana per 100 ml directly into an already prepared baby bottle and shake well. Baby bottle with cow’s milk (not before 12 months of age): Fill 7–8 measuring spoons of Bimbosan Hosana into the bottle. Pap with infant formula: Bring water to boiling point. Mix 4–6 tablespoons of Bimbosan Hosana and 4–6 measuring spoons of milk powder with water cooled down to 45 °C. Add water as preferred. Pap with cow’s milk (not before 12 months of age): Mix 4–6 tablespoons of Bimbosan Hosana with 120 ml cow’s milk and 60–100 ml water. Homemade pap: 1–2 tablespoons of Bimbosan Hosana can be added to any homemade pap. Add water as preferred. 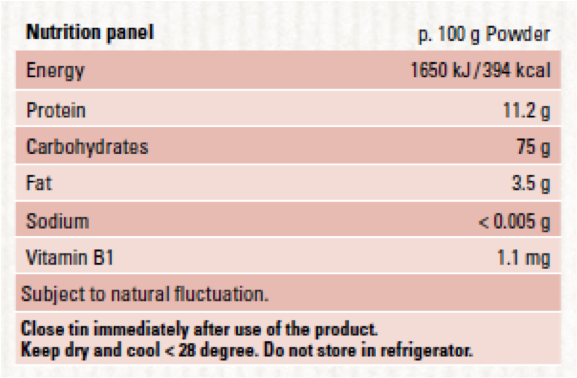 Additional advice: Fruit and vegetable meals become more nutritious and nourishing by adding Hosana. 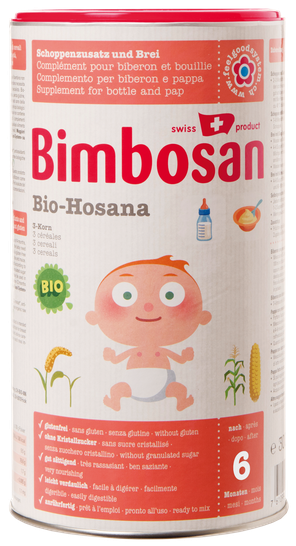 If your baby has a sensitive stomach or a large appetite, add Bimbosan Hosana to the baby meal. Meals with fruits and vegetables are even tastier and more nourishing when you add Bimbosan Hosana. Add Bimbosan Hosana to the ready-to-eat meal. Bimbosan Hosana is also ideal for gluten-free diets (for adults too). Organic flours: 33% millet*, 33% rice*, 33% maize* from strictly controlled organic cultivation, antioxidants (rich in tocopherol extracts), vitamin B1. *These organic raw materials correspond to the strict Swiss organic «Bud» rules. All-natural baby cereal made from seven pure, certified organic grain varieties. The very nourishing multi-grain cereal stills large appetite and helps the baby to sleep throughout the night. It has a well-balanced grain formulation and is in harmony with the baby’s digestive system. Its unique powder texture is easy to mix with breast milk or infant formula in the baby’s bottle or as a pap. Premium Swiss quality. For baby bottles mixed with breastmilk, baby milk powder or cow's milk> For paps mixed with breastmilk, baby milk powder or cow's milk. For pap mixed with home-made, fresh ingredients. Highly recommended for babies, who have a large appetite at night and can't sleep throughout the night. Baby bottle with breast milk or infant formula: Put 2–3 measuring spoons Bimbosan Bio-7 per 100 ml directly into an already prepared baby bottle and shake well. 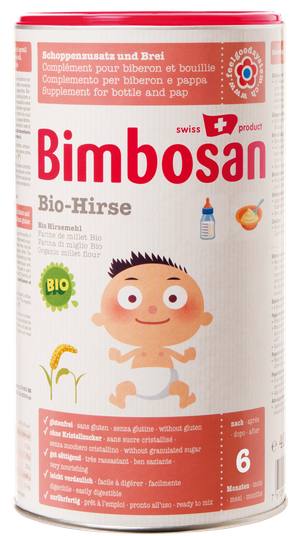 Baby bottle with cow’s milk (not before 12 months of age): Fill 7–8 measuring spoons of Bimbosan Bio-7 into the bottle. Pap with infant formula: Bring water to boiling point. 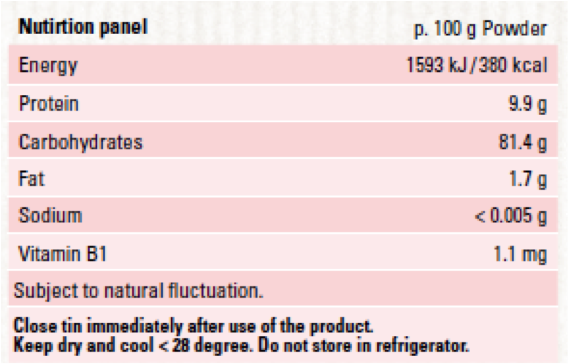 Mix 4–6 tablespoons of Bimbosan Bio-7 and 4–6 measuring spoons of milk powder with water cooled down to 45 °C. Add water as preferred. Pap with cow’s milk (not before 12 months of age): Mix 4–6 tablespoons of Bimbosan Bio-7 with 120 ml cow’s milk and 60–100 ml water. Homemade pap: 1–2 tablespoons of Bimbosan Bio-7 can be added to any homemade pap. Add water as preferred. 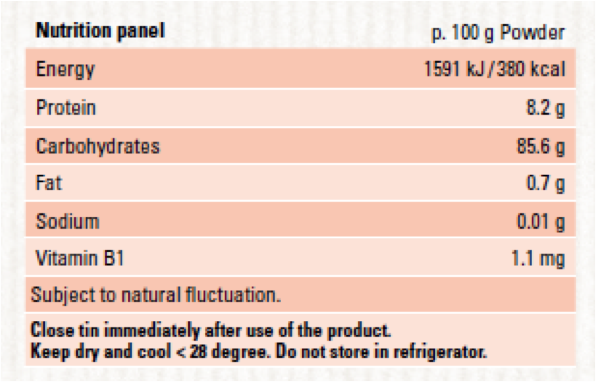 Additional advice: Fruit and vegetable meals become more nutritious and nourishing by adding Bio-7. 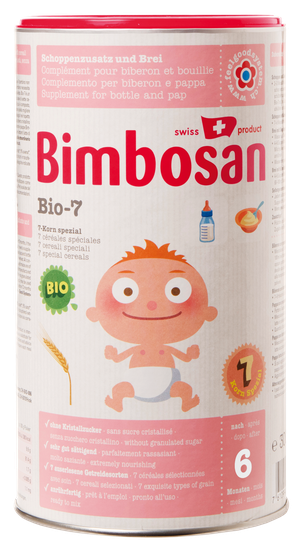 If your baby has a large appetite and can't sleep at night, add Bimbosan BIO-7 to the baby meal. Meals with fruits and vegetables are even tastier and more nourishing when you add Bimbosan BIO-7. Add Bimbosan BIO-7 to the ready-to-eat meal. Organic flours of 44% rice*, 18% millet*, 18% spelt*, 5% oats*, 5% rye*, 5% barley* and 5% corn* from strictly controlled organic cultivation, antioxidants (rich in tocopherol extracts), vitamin B1. Contains gluten. Distributor of Swiss Premium Baby Brands in Southeast Asia. Sole authorized distributor of Bimbosan in Singapore.